You may have already heard about Jim Estill. He’s the CEO of an appliance company who is footing the bill to sponsor 50 Syrian refugee families to his home community of Guelph, a growing city in Ontario, Canada. What you may not know is that his efforts extend well beyond corporate philanthropy. He’s not interested in stopping at the personal donation of over $1 million. It’s more of an investment, and Estill is coordinating a whole-of-community effort to nurture it. A business leader and entrepreneur, he brings a unique set of skills to preparing for the resettlement of 50 families. Estill approached the enormous task as he would any business problem. He took his private sector expertise and created a volunteer organizational structure to ensure that the families arriving in Guelph settle successfully. Community service agencies are welcome partners, especially in their areas of specialization. Just one of the organization’s goals is to ensure every refugee family is paired with an Arabic speaking mentor, which is possible with Guelph’s increasing diversity including on its university campus. Tapping his entrepreneurial background, Estill is organizing volunteers with an agile “scrum” approach, where small teams are given freedom to collaborate outside of tightly scripted and usually linear direction. When it comes to resettling refugees, it means maximize the organization’s ability to deliver quickly, respond to emerging requirements and adapt to evolving issues and changes in family conditions. Part of settling well is finding employment. Good employment. Employment can be a tricky part of resettlement, but not because refugees are unqualified or unfit for work. They are often educated, of all skill types, and eager to get back to work after leaving careers in their home country out of fear for safety. Just like other immigrant groups, however, refugees too often end up in jobs well below their skill level. Supporting refugees in finding meaningful employment is an important piece of long-term newcomer success, requiring not just finding any jobs, but jobs that suit the individual. This is where Estill thinks Guelph will excel. Finding jobs of all skill levels won’t be a problem. Guelph’s diverse economy needs workers. The city straddles more than one link between old and new. With deep roots in farming, today Guelph is known for excellence in agriculture, bolstered by flagship programs at the University of Guelph and an innovative business community leading the region to its current rank as the province’s top agricultural biotechnology cluster. Guelph is home to several high growth sectors including advanced manufacturing and environmental management and technology. Quality of life is high, with a picturesque stone-plated downtown core, and commuter and industrial rail links to the nearby Greater Toronto Area. Local business is ready for refugee talent. The demand for workers began organically. When Estill and his volunteers called Best Western and Days Inn to ask for rooms for temporary housing, the hotel chains responded with a request for staff. Other opportunities abound in the service industry, but do not stop there. Workers are needed in light assembly and in more advanced manufacturing firms, as machinists and machine operators, as well as in programming. Construction is another industry with high demand for skilled trades like mechanics, electricians, drywallers, and other contractors. Because speaking the language is key to a lot of the work and especially to success over time, Estill is working with local educational institutions to be ready to offer language and other training opportunities. In addition to employment-focused learning, education for the entire family is a priority. Every school age child will be assigned a tutor. Estill’s organization will run summer classes to provide further support. Adults will have access to beginner, intermediate, advanced ESL courses. They also plan to provide ESL training to seniors, to ensure they are not socially isolated, now and in the future. Like employers in Calgary and Halifax, Estill sees the value of hiring refugees. 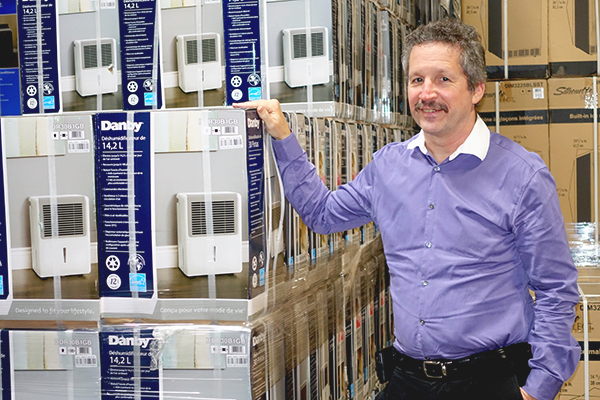 His company, Danby, will be among those looking to hire the newcomers for warehouse and assembly work. Although, because of his role in bringing the refugees to Guelph, Estill said he wants to give other employers the first chance to hire. He’s been busy approaching other businesses about the opportunity to hire, as well as encouraging other ways to support new employees. Recognizing that displaced people often start out underemployed and work their way up, he wants local employers to give refugees opportunities and to be flexible. Many newcomers may not be able to take a full time job in the short term. Initially, employers may need to offer part time jobs, even temporary jobs. Estill is making effective use of his business network. He knows that, above all, they’re looking for good, loyal, hardworking and long-term workers. And that is what he is offering them. Hiring: Contact local immigrant or employment service providers, who could connect you to job seekers. The local economic development or employment service is another good resource. (See the experience of Maple Trade Finance). Diversity and inclusion: Match new employees with a mentor in the workplace. Mentoring supports the integration of the newcomer into the unique culture of your business, and helps develop the leadership skills of the mentors. Another benefit of a mentoring relationship is the language practice it offers, especially the nuances of the workplace (often technical) language. Diversity and inclusion: Integrate cultural training into other employee training days or programs. There are simple, easy ways to increase empathy and understanding across cultures. (See a simple language game pioneered by 3M). Upskilling: Promote professional development of newcomer employees through lunch and learns, workshops and conferences, and participation in projects.